This little hardback book of Jane Austen quotes is a quaint collection of her words around “Sisters, Suitors, Families and Friends” that does itself the disservice of looking unattractive. I found the 1999 Grange Books, DoveTail imprint, published A Jane Austen Miscellany at City Basement Books in Melbourne for the cheap price of $5, and snapped it up happily. I also bought a couple of poetry books (Keats) and a children’s book – all very well priced. Originally advertised at £6.98 cover price, ISBN: 1840132442, this book looks hardly touched. It’s unassuming, with a cover that looks more like a schoolbook or an instructional book, but it has charmingly selected quotes. I particularly like this book as it keys into something I have always believed to be true – and one of the aspects that shaped the name of this blog, The Bennet Sisters – and that is the importance of family relationships. The first section of quotes is ‘sisters’, and bringing us in with a paragraph explaining the importance of sisterhood, we lead into the first quote – of course, from Pride and Prejudice. It is a quote that shows Elizabeth looking towards Jane and Mr Bingley. We have another three from Pride and Prejudice in this section, and a hefty spattering of Sense and Sensibility. The other sections are far more regular – suits, family (generally) and friends being topics of entire Jane Austen books in themselves. While this compendium by no means stands out in any of these ways, the referencing towards sisters and the importance of these relationships very much struck me. Other than this, the chapters are largely what can be expected from a quote collection – likely enough to amuse a die-hard Janeite, but unlikely to attract the interest of a casual Pride and Prejudice reader. I give my heartfelt thanks to Kristen Cleary and Robin Langley, though, as they have edited/compiled the quotes with little intrusion other than selection and arrangement and the occasional introduction to a section. This is refreshing in a space where everybody wants their voice heard. Sometimes, it’s worth getting back to the raw basics and letting Jane Austen speak for herself, particularly on these matters of relationships, and it’s gratifying to see some restraint shown by the editors. 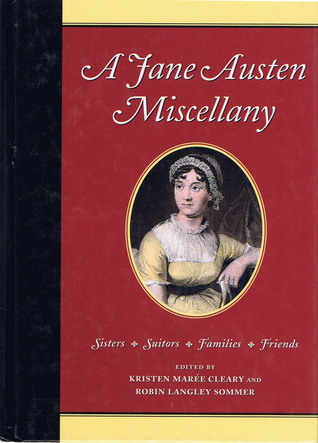 Since its 1999 publishing, there have been a number of other Jane Austen Miscellany-titled books, which have received far more interest than this modest volume. While I’m not a fan of the cover and book design, from Zigan Design, a thumbs up should be given to Nancy Carter and the North Wind Picture Archives for the illustrated/coloured Jane Austen portrait. Carter is currently the director of the establishment, according to her LinkedIn, and is in Portland. It’s nice to see Jane’s image come to life a little more and some attention to detail that matches the feel of the book – it adds a new lens through which to view Austen, but it doesn’t intrude or outshine what is originally being said. I do wish it were slightly longer. The 64-page volume has me clamouring for more Austen-themed advice on other topics. It appears as though it would perhaps sit nicely in a collection of books from other authors’ quotes on different topics, however it doesn’t appear to be, rather being a standalone piece. I did enjoy seeing some of our favourite Pride and Prejudice moments regardless – the opening sentence, the Dary proposal and even his second proposal. I will need to head back to City Basement Books at some point to see what other Austen-related material I can snap up. It’s a beautiful bookshop with so much to explore. Sadly, however, it does not open late on weekdays.